Much has been written on love and the process of falling in love. Love takes time and effort. When you fall in love with a person, you actually accept his values, philosophies, and beliefs. That touch, word and smile, the kiss and goodbye- you connect and feel each other through all. The bond of love, however, grows through many trials. And do you know what ultimately makes you fall for another person? Love ultimately is manifested in life through certain questions. Falling in love is essentially getting to know one another. As two individuals communicate and converse, they learn new things about each other. Together they grow, and intimacy is developed. Intimacy involves how two individuals share and live new experiences, and become vulnerable in front of each other. When you become intimate, time hardly matters. The fundamentals of falling in love lie in the proper form of communication, and not in the amount of hours spent with each other. Arthur Aron, a psychologist had demonstrated that even two strangers can fall in love through communication (in the form of questions). In his experiment, two strangers fall in love as they ask questions. 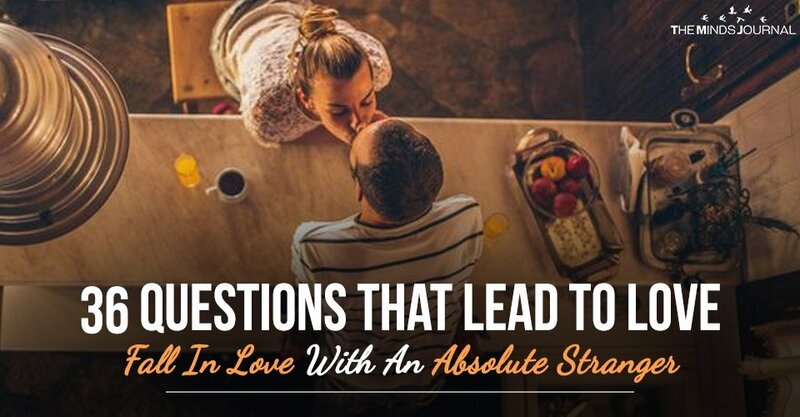 Following are 3 sets of questions, designed by the famous psychologist, Arthur Aron- which according to his research will make even two strangers fall in love easily. The initial questions are innocuous, but gradually they become more personal. So let’s start the great Spanish Inquisition of love! 1. Who would you want as your dinner guest? 2. In what way would you like to be famous? 3. What is a perfect day for you? 4. Do you rehearse before making a phone call? 5. When was the last time you sang? Was it for yourself or somebody else? The mind of a 30 year old or the body of a 30-year old at the age of 90? 7. Do you have any hunch that tells you how you will die? 9. What are you most grateful for in your life? 10. If given a chance, what would you like to change about your childhood? 11. In 4 minutes, how will you describe yourself? 12. What 1 quality would you like to have that you think you do not have? 1. Supposedly to get hold of a crystal ball and know how to use it. What will you like to know from it- about your future, your life, 1 truth about yourself, or anything else? 2. Why haven’t you done something that you have always dreamed of doing? 3. What according to you is the greatest achievement of your life? 4. What is friendship to you? 5. Which is that memory till date, that you will treasure until your last breath? 6. What is the most horrific memory of your life? 7. If you are to die tomorrow, how will you live today? 8. What is the importance of love and affection in your life? 9. Are you close to your mother? 10. What are familial bonds with you? Do you think you had a far happier childhood than most people?